Carte De L'Allemagne Par Cercles en 1789. No. 47. Grave par Thierry. 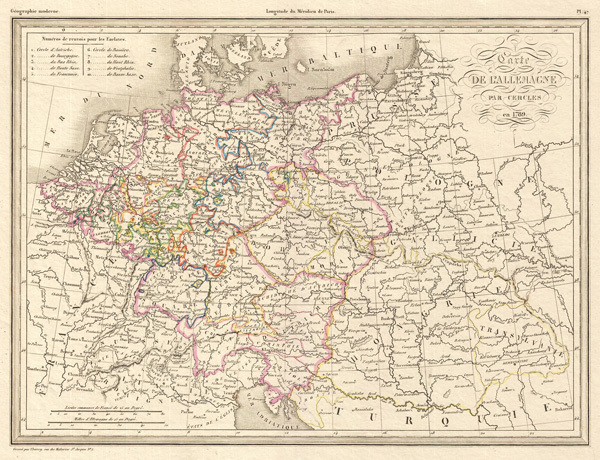 Malte-Conrad's historical 1839 map of Germany and Poland as it appeared in 1789. Covers from the North Sea to the Adriatic, and east as far as Poland, Hungary, and Transylvania. States and districts outlined in color. Published as plate no. 47 in Conrad Malte-Brun's 1839 Geographie Moderne. Malte-brun, C., Geographie Moderne, (Paris) c. 1839.